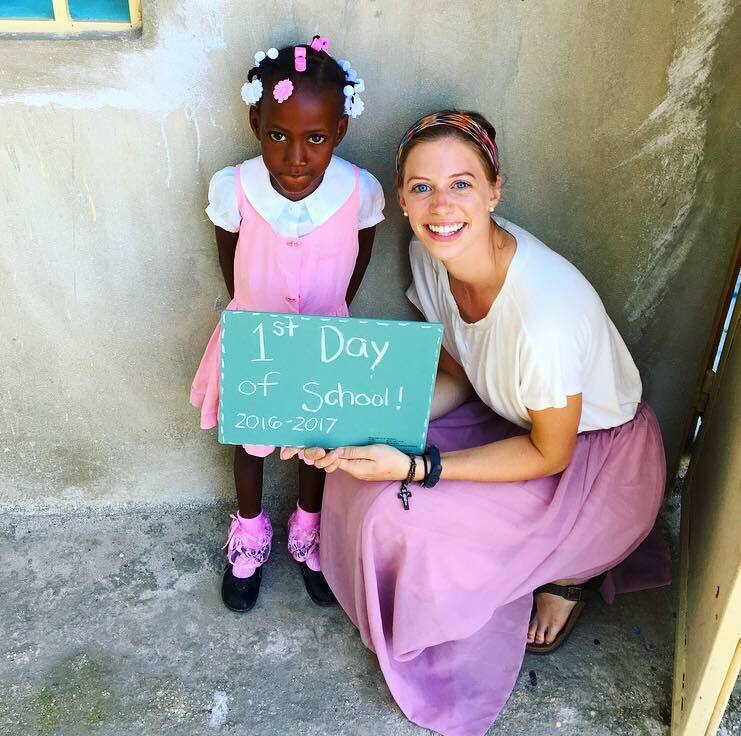 Many of you have been following my many posts on my personal Facebook about my sweet girl Nana and her health journey, but I wanted to share it in its entirety because it truly is a beautiful story of the redemptive work that the Lord is doing in Haiti. I am so incredibly GRATEFUL for the ways the Lord has been moving and for the fact that I get to witness it and share it with others. Within the first week of moving to Haiti I met sweet Nana. Her dad had helped out with some of the school construction which was how she came to be registered for our school. She had never been to school before. Her mom had died when she was just a baby and her 16 year old sister looked after her. On the first day of school she hardly spoke at all and did not smile once, until lunch time! She was ravenous and everyday would immediately want to eat a snack upon arriving at school and would finish two heaping plates of lunch. During the first week of school we noticed her ear was quite infected (won’t go into details here but it wasn’t pretty). We took her home and her dad said he had taken her to the doctor before and they couldn’t do anything. A few weeks into the school year we noticed she was not being cared for. She would come to school with a dirty uniform and her hair not done, or sometimes not come to school till much later because no one was available to walk her. Her older sister had a newborn baby several months prior, so she was not able to care for Nana like she once was. Both my heart, and my classroom assistant (and Haitian bestie) Ti Malen’s heart were breaking for her. No one would come to pick up little Nana from school so most days I would walk her home. Upon arriving at her house her dad would call after me “Take her, I don’t want to care for her. She is your child now!” I would laugh it off, give her a kiss goodbye, but inside my heart was breaking knowing this child was not being cared for as she deserved to be. Even though her father loved her, he was not able to provide for her as a father should. After several weeks of this I could not get Nana out of my mind. This was a time full of tearful conversations to my parents, lots of on my knees prayer, googling adoption processes in Haiti, and begging the Lord to show us what to do. During this time, my assistant came to me one night. Her heart had been stirred by the same heartache as mine. She shared that she wanted to care for Nana. This 24 year old girl had just graduated high school the summer prior, she lives in a small two room house with her large family, and yet she wanted to give of herself to take in and love this sweet child. I rejoiced knowing my prayers were answered and that this was the best situation for now. It was such a victory knowing that now Nana was being cared for and was much happier. She came to school clean, on time, and she had Ti Malen’s whole family loving on her, as well as some more friends around her age to play with that lived in the same circle of houses. It was at this time that we noticed that Nana’s health was not good. Despite her eating breakfast and lunch at school everyday, she had not gained any weight. She had an irregular heartbeat, would get out of breath very quickly, and eventually started coughing and throwing up several times a day. For weeks we took her to clinics and doctors in the area. We were constantly having doctors not show up for appointments, or simply prescribing vitamin c and an antibiotic. She started getting a really high fever every afternoon to the point where after lunch most days she would crawl into my lap and just cry and fall asleep for the rest of the school day. Leaving to go back to America for Christmas break was one of the hardest things. I couldn’t bear leaving Nana behind and knowing that if only she could come with me she would get some decent healthcare and some answers. God is faithful though because in January, my dad was able to connect me with probably the best pediatric hospital in Port au Prince, Saint Damiens. Father/Doctor Rick Frachette is an American Passionist priest who has been living in Haiti for nearly 30 years (check out his incredible book, The God of Tough Places) serving at this hospital he created. He has done incredible work in Haiti and my family got to know him through their support of Nuestros Pequenos Hermanos. We found out that Nana had quite advanced tuberculosis, as well as malnourishment. They admitted her to the hospital just a few days later where she was to stay for two months of her six month treatment. Ti Malen moved there with her, staying there with her the entire time, sleeping on the floor next to her hospital bed every night, and caring for her- talk about a living saint. I was able to visit most weekends, which sometimes consisted of a four hour drive in each direction for a quick 10 minutes, but it was completely worth it. She improved quite quickly and after about a week on oxygen she was much less lethargic and had new energy. She had a few complications as a result of the tuberculosis, including a bad ear infection and facial paralysis. She still needs to continue her treatment, but as of TODAY she is back in our town of Madian and will be able to come back to school!! She surprised us at lunch and my heart burst with joy seeing her out of her hospital room, healthier and happier. There are too many beautiful parts of this story to fully share, so many ways that the Lord has been working in Nana’s life, so many people He has been witnessing to of His beautiful and healing love. Thank you for all of those who have been her prayer warriors, who have donated to help cover her medical costs, who have sent words of encouragement, or donated childrens movies to keep her entertained in the hospital. I am fully convinced that if I uprooted my life and moved to Haiti, just for this one little girl, then it was all completely worth it. She has stolen my heart and the Lord has saved her life. This is the story of Nana and thanks be to God, it is just getting started.